A veteran British barrister must defend his client in a murder trial that has surprise after surprise. IT STAGGERS THE SENSES!...SHOCKS the Imagination - It will leave you Gasping - It is the Sensation of 3 Continents! Hans Beckert: That is a nice ball you have. Q: What is 'M' about? 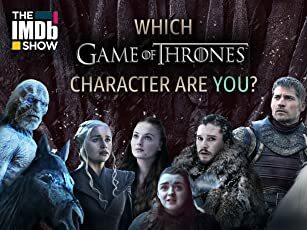 Q: Is 'M' based on a book? Q: Is it true that there is a comic book based on "M"? Fritz Lang's highly influential career as a film director began in post World War I Germany, where he was a leading figure in the German Expressionist film movement, and ended in the United States in 1953 with the production of The Big Heat, a film noir classic. Perhaps his greatest film, M (Germany, 1931) forms an historical bridge between expressionism and film noir. Like the former it uses strange and disturbing compositions of light and dark in order to symbolize the inner workings of the human mind; like the latter it more realistically sets its story in a modern urban setting and blends in sociological issues along with the psychological and moral ones. 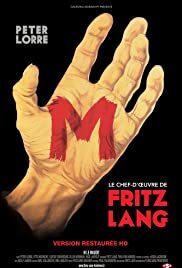 Even though M was Lang's (and Germany's) first sound film, many historians cite it as the initial masterpiece of cinema to appear following the introduction of sound into films in the late 1920's. While most early "talkies" return films to their static, visually monotonous, stage- imitative beginnings and thus limit rather than expand the artistic possibilities of the medium, M avoids the failing by skillfully balancing asynchronous, off-screen sounds with the more limiting use of synchronous dialogue. The film's editing, particularly its elaborate use of parallel cutting, also contributes kinetic energy and fluidity to the storytelling. Of course, many of the film's sound effects are also imaginative and memorable, none more so than the compulsive whistling of the film's central character, the stalker and serial killer of little girls Hans Beckert (magnificently played by Peter Lorre). Sound is also an important contributor to M's rich and influential use of off screen space. One famous example is the scene that introduces Beckert as a shadow against his own Wanted poster, creepily intoning to his next victim, Elsie Beckmann, "You have a very pretty ball." Not only is Beckert's shadow a bow toward Lang's expressionist artistic roots, but it ironically places the murderer in the implied space in front of the image - that is, among us, the human community of viewers of which he is an innocuous-appearing, albeit monstrous, member. Another example of Lang's use of off-screen space is the montage of shots whose common denominator is Elsie's absence from them: an empty chair at the Beckmann dinner table, the vertiginous stairwell down which Elsie's mother searches compulsively and futilely for signs of her daughter's arrival, the attic play area that awaits Elsie's return from school. Most memorable of all - and most often alluded to visually in other films - is the series of shots that indirectly record Beckert's assault and murder of the innocent child, representing these off screen events metonymically via the entry of Elsie's ball from bushes along on the right edge of the frame and the release of her balloon from telephone wires and off the left edge of the frame. Never in the history of cinema has something so terrible been communicated through such powerfully understated images. Beyond its technical brilliance, the keys to M's lasting impact are its psychologically convincing portrait of Hans Beckert's twisted compulsion and the still relevant ambivalence of his capture and "trial." Unlike contemporary cinematic examples of the serial killer, Beckert is not presented simply as a grotesque psychopath. Nor is the issue of how society should deal with him at all clear-cut. To be sure, the gut-reaction of most film audiences is to root on the underworld mobsters and petty thieves who, beating the established authorities to their mutual quarry, capture Beckert and bring him to a mock- formal trial whose conclusion is foregone. Like many in America today, Beckert's accusers are disinclined to listen to insanity pleas and would just as soon be rid of the "monster" in the surest way possible: a summary death penalty with as little fretting about legal rights as possible. Considering the heinousness of Beckert's crimes and the imperfections of a legal/medical system that could well turn him loose to kill again, this emotional response is hard to resist. Yet M is by no means an endorsement of vigilantism - quite the contrary. Through the unlikely rhetorical persuasions of Beckert's unkempt "court appointed" defense attorney and Beckert's own impassioned monologue, Lang strongly implies that impatience with democratic judicial procedure and a paranoid eagerness to scapegoat others (guilty or not) in the name of order are symptomatic of the social hysteria breeding Nazism in 1930s Germany. That the ruthless killer who heads the underworld looks, dresses, and gestures like a Gestapo officer is no accident. Moreover, the letter "M" chalked on Beckert's back by one of his pursuers not only stands for "murderer" but also alludes to God's marking of Cain. While the popular misconception holds that the mark of Cain symbolizes his evil, it in fact represents God's warning to Cain's flawed fellow creatures not to mete out wrathful vengeance, but to leave justice in God's hands. Translated into secular terms (and literally entering the shot from the top of the frame), God's hands in M belong to the legitimate authorities that intervene at the last moment to arrest and try Hans Beckert "in the name of the Law." 103 of 117 people found this review helpful. Was this review helpful to you?